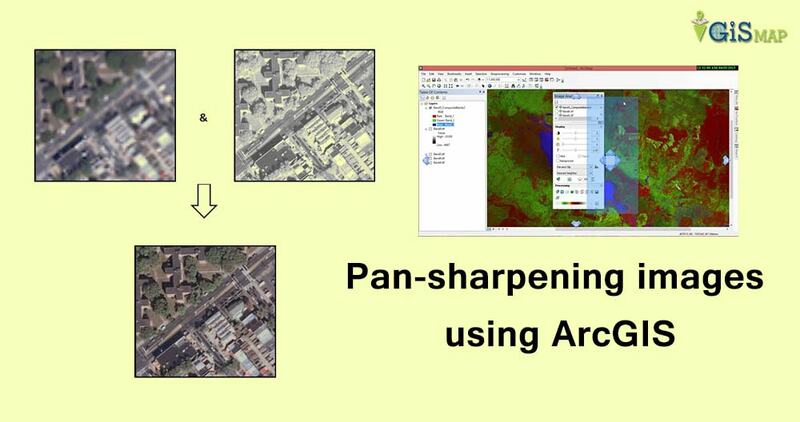 Pan-sharpening images using ArcGIS. Pansharpening is the process which makes use of panchromatic image and some bands of multispectral image to result in a high resolution image. Pansharpening stands for panchromatic sharpening. Here sharpening basic refers to increase the spatial resolution of multisprectral image or color image. This technique of increasing resolution has been used by various organisations that provide satellite imagery of high resolution like Google images etc. A multi spectral image is captured with high spectral resolution as it is displayed in different colors while the panachromatic image is captured with high spatial resolution and provides a cluster of red, green and blue pixels resulting in a gray scale image.Now the question is how we get a pan-sharpened image? The possible answer by an ArcGIS user can be it’s just a tool to run. But is it that easy? No. Both the images has to be pre-processed before applying this tool which comes out to be a tough process if you have a number of tiles for your area of interest. First of all start with the multispectral image let’s say a cartosat image with a resolution of 1 arc sec. Start with stacking of different bands(either all even or all odd number) in Erdas imagine. Perform Geo-referencing of each tile making one tile static. Then mosaicing of tiles in ArcGIS using Mosaic tool of data management tool set. The panchromatic image will be a single band image say panchromatic band of lansat image with 15 m resolution so it does not need to be stacked. So just mosaic all the tiles of panchromatic image. Geo-reference both multispectral and panchromatic image accordingly so that they both are same spatial location without any spatial difference. Now apply tool create pan-sharpened raster data-set of data management tool-set. Thus a multispectral image with high spatial resolution is obtained. As panchromatic image possess high spatial information and multispectral image possess good color information. Fusion of the two brings out a colored image of high resolution which can be used as a product for any client who want an detailed view of his area of interest.